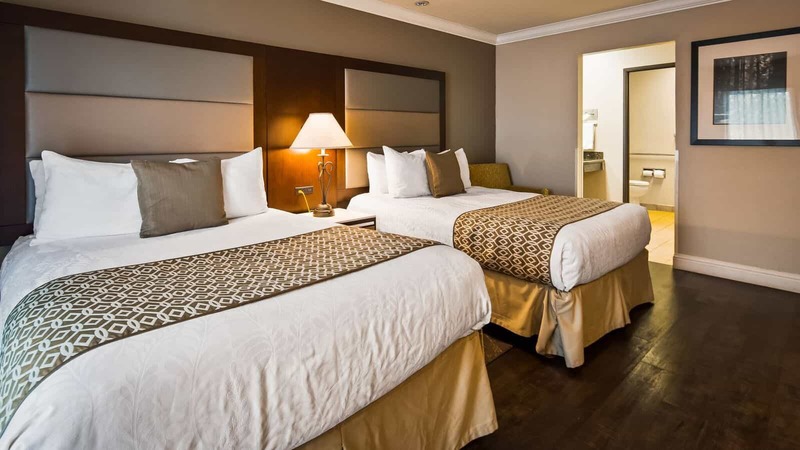 The Best Western Plus Forest Park Inn offers the most beautiful guest rooms all with private balconies for a personal view of the night in Gilroy to enjoy with your loved ones. Every room we offer comes with built-in wireless internet, a flat screen 37-inch television with HBO for your entertainment needs, a refrigerator, and even a coffee maker for those who need that early morning or late night pick me up. Why bother looking for other hotels in Gilroy? Here at Best Western Plus Forest Park Inn we offer everything you’d ever desire. up to a delicious complimentary breakfast. Our high quality rooms also include king size triple sheeted beds, a beautiful fireplace, and a relaxing whirlpool bathtub to help you unwind from the tiredness of the day. Our highly rated staff is always waiting to give you first-class service! We are proud to be a 100% non-smoking hotel! Our ample king bedrooms are over 350 square feet. Each room is fitted with luxurious fabrics and relaxing furnishings. These king sized rooms are guaranteed to be 100% non-smoking and offer free wireless internet access, 37-inch HD television, a refrigerator, coffee maker, iron, and much more for your convenience. Need a little private time? All King Bed Standard Rooms comes with a fully furnished patio or balcony. Enjoy the peaceful nights here in Gilroy, California. We also have a King Bed Standard Room with Fireplace?, a King Bed Standard Room with Whirlpool Bath and Fireplace ?and an Executive King Bed Room – Bridal Suite for your own level of sophistication and comfort. Each guest can also enjoy their complimentary breakfast that includes: make your own pancakes, sliced bread, muffins, cereal, fruit, yogurt, as well as coffee, milk and juice. 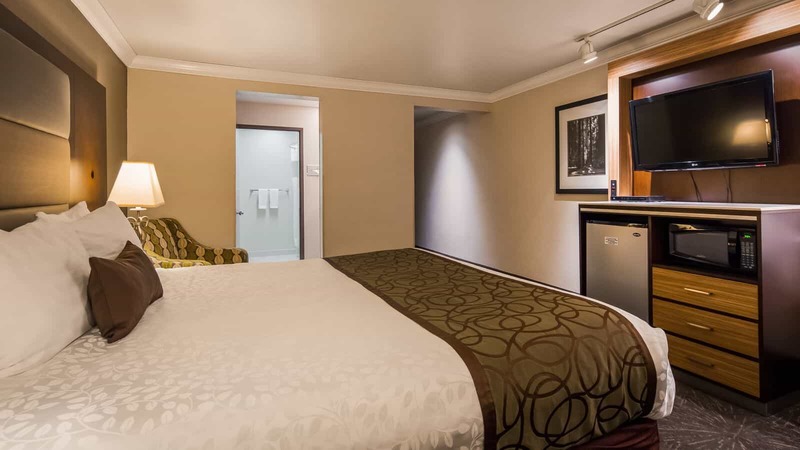 This spacious room holds two queen beds for you and your loved ones. It also includes a private balcony, a 37-inch TV set, a refrigerator, a coffee maker, and an iron. Each guest also can enjoy their own free complimentary breakfast from the hotel. This spacious family suite comes with two separate rooms and three queen size beds, with the one queen size bed in the separate room. Both rooms hold a private balcony with seating, free wireless internet access, 37-inch HD television, refrigerators, etc. It is also fully air conditioned for your comfort. 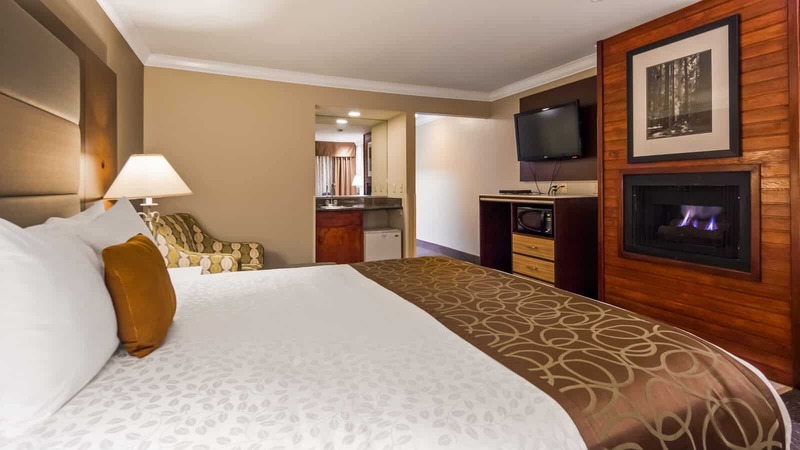 Our spacious family suite is equipped with 2 separate rooms and 3 queen size beds. The separate room has one queen size bed. All rooms feature private patios or balconies with seating. These charming guestrooms are 100% non-smoking and offer free wireless Internet access, 37-inch HD television with over 100 channels including HBO/Cinemax/ESPN package, refrigerators, air conditioning, coffee makers, irons and more. 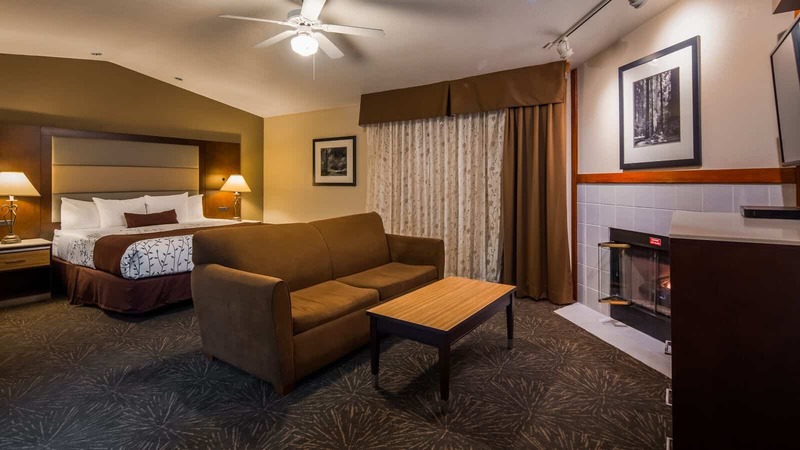 Our king fireplace rooms are ideal for a romantic getaway. All rooms feature private patios or balconies with seating. These charming guestrooms are 100% non-smoking and offer free wireless Internet access, 37-inch HD television with over 100 channels including HBO/Cinemax/ESPN package, refrigerators, air conditioning, coffee makers, irons and more. Our luxurious king room with fireplace and jetted tub offers a 37-inch LCD TV, balcony, MP3 alarm clock radio, refrigerator, iron/ironing board, and one cup coffee maker. Each room has a sofa bed and large spacious balcony. Each guest can enjoy a complimentary hot breakfast buffet that includes: make your own pancakes, sliced bread, muffins, cereal, fruit, yogurt, as well as coffee, and juice. If you’re overwhelmed while searching for hotels in Gilroy, CA you can finally breathe a sigh of relief. At the Best Western Plus Forest Park Inn, we’ve got you covered, whether you are traveling alone, with your family or business guests. Not only can we accommodate you and your family, but your pets can stay with us too! We know its not always easy to find a pet sitter on a short notice. That’s why our hotel is pet friendly making sure your furry friends enjoy a comfortable stay while away from home. Pets are considered part of the family here at the Best Western Plus in Gilroy, whether you’re traveling with kids or your spouse, rest assured you will all have an amazing stay. Our pet policy is an affordable $20 a day, per pet with a three day maximum stay. If you require further accommodations, please call us at 408-848-5144, email us at bwforestparkinn@sbcglobal.net, or contact us here. Located at the southernmost tip of the Santa Clara County is Gilroy, California, dubbed as the Garlic Capital of The World and renowned for its boutique wine production. If you are looking for a summer vacation destination, Gilroy offers several fun activities that will appeal to every member of your family. Make learning fun and accessible for the kids by visiting the Monterey Bay Aquarium, Children’s Discovery Museum or The Tech Museum. Epicures will delight in the offerings found at local wineries, Casa de Fruta and at the Fisherman’s Wharf. And ladies, as well as the rest of the family, can schedule a session of retail therapy at Gilroy Premium Outlets. 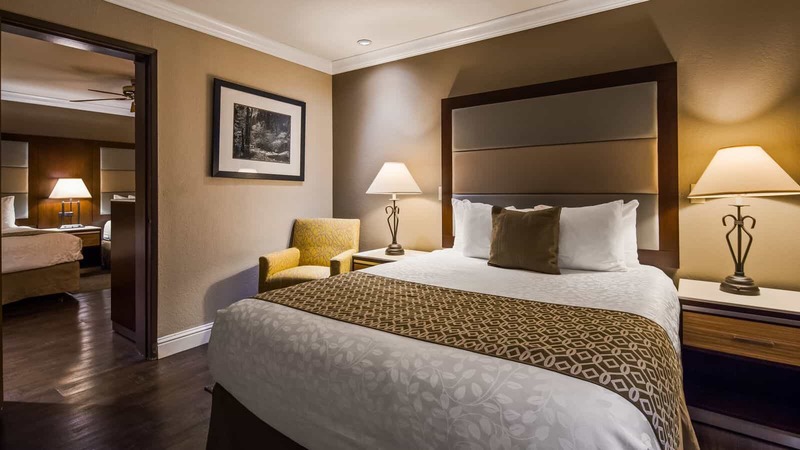 And after a day of fun-filled activities, you’d want to rest your weary bodies by staying at one of the best hotels in Gilroy, CA – The Best Western Plus Forest Park Inn. 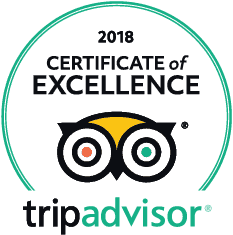 Find out for yourself why we have been awarded the Certificate of Excellence by TripAdvisor and why we are recognized as the number one Gilroy hotel. We’re a 100 percent non-smoking hotel and we welcome pets. You do not have to leave Fido behind for the family vacation — we assure you that he’ll get as much fun and enjoyment as his human companions will, too. Whether you are traveling with your special someone or with the whole gang, we offer different room sizes to accommodate your needs. All rooms have high-speed Internet access, and to start your day right, you’ll get a full breakfast no matter what room you choose. Couples can choose the 1 King Bed Room or 1 King Bed with Mobility Access equipped with a mobility accessible bathtub, 1 King Bed with fireplace, 1 King Bed with Whirlpool bath and fireplace or the Executive King Bedroom. Larger parties can opt for the 2 Queen Beds Room or the Suite-Family Suite with 2 queen beds — the largest room you’ll find in Gilroy. Apart from high-speed Internet access, each room comes with private balconies, 37-inch flat screen TVs, satellite television, refrigerator and a coffee maker. Best Western is also the perfect venue for a more laidback staycation. Wade lazily in our heated outdoor pool and spa or catch up on your training regimen at our exercise room equipped with treadmills and recumbent bikes. Should you wish to check in on your business, we offer free local phone calls and you can request for rooms with spacious business desks and ergonomic swivel chairs. Families with differently-abled members can request for handicap rooms while those with babies may use a complimentary crib upon request. And if you are looking for a romantic getaway, you can inquire about our Gilroy hotel deals.